Theta (4–12 Hz) and gamma (30–80 Hz) rhythms are considered important for cortical and hippocampal function. Although several neuron types are implicated in rhythmogenesis, the exact cellular mechanisms remain unknown. Subthreshold electric fields provide a flexible, area-specific tool to modulate neural activity and directly test functional hypotheses. 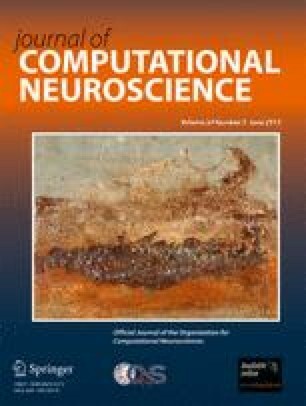 Here we present experimental and computational evidence of the interplay among hippocampal synaptic circuitry, neuronal morphology, external electric fields, and network activity. Electrophysiological data are used to constrain and validate an anatomically and biophysically realistic model of area CA1 containing pyramidal cells and two interneuron types: dendritic- and perisomatic-targeting. We report two lines of results: addressing the network structure capable of generating theta-modulated gamma rhythms, and demonstrating electric field effects on those rhythms. First, theta-modulated gamma rhythms require specific inhibitory connectivity. In one configuration, GABAergic axo-dendritic feedback on pyramidal cells is only effective in proximal but not distal layers. An alternative configuration requires two distinct perisomatic interneuron classes, one exclusively receiving excitatory contacts, the other additionally targeted by inhibition. These observations suggest novel roles for particular classes of oriens and basket cells. The second major finding is that subthreshold electric fields robustly alter the balance between different rhythms. Independent of network configuration, positive electric fields decrease, while negative fields increase the theta/gamma ratio. Moreover, electric fields differentially affect average theta frequency depending on specific synaptic connectivity. These results support the testable prediction that subthreshold electric fields can alter hippocampal rhythms, suggesting new approaches to explore their cognitive functions and underlying circuitry. The authors are thankful to Drs. C. McIntyre and M. Robertson for sharing initial code of extracellular electric field implementation in NEURON, Dr. John L. Baker and Mr. Kerry Brown for feedback on a previous version of the manuscript, and financial support from NIH grants R01 MH50006, K02 MH01493, R01 NS39600, R01 AG25633, R21 NS58816, and ONR grant MURI N00014-10-1-0198.